Are you ready to sit down and speak to your daughter about puberty? As a Muslima, it's your duty to educate your daughter about puberty. Otherwise, she'll learn the hard way, leaving you to blame when she gets it wrong. But if you learned the hard way, you won't know how to approach it. So how should you approach it? And how do you earn the confidence of your daughter so that she turns to you when she needs help? If you don't have the answers, you'll turn puberty into a taboo until she grows up and repeats the cycle of ignorance. But what if you had answers? Even better, what if you had something to help you? Something that could help teach her about puberty and her changing body? That helped her realise she isn’t alone? That gave practical advice based on other women’s experiences? Something that could help her learn how to worship Allah as a woman? Something that you could both reference? 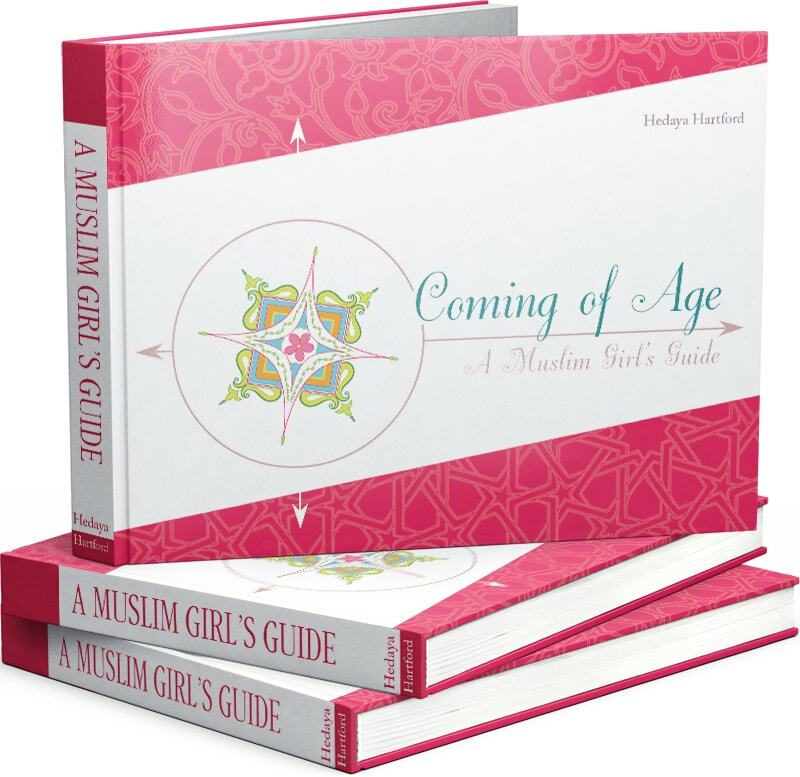 Coming of Age: A Muslim Girl's Guide is a beautiful guide written to help you teach your daughter about puberty from religious, biological and practical points of view. And because the guide has been written and designed for young girls, it's both easy and fun to learn from. Coming of Age is a unique 375 page guide written to help you guide your daughter through puberty and it's best if you look inside. Submit your email address and we'll email you a free 37 page sample for you to look through. As a parent or guardian, it is your religious duty to educate your children about religion, which includes teaching them about puberty. You need to understand that in the absence of correct and complete information about puberty, your daughter may feel frightened and confused due to the changes in her body. You cannot sit back and assume everything will turn out to be just fine. The cultural taboo which surrounds puberty has no basis in the Sacred Law and it is her right over you that you teach her the legal rulings of puberty before she reaches it. It's also important to have a relationship with your children such that they feel safe to discuss anything with you. 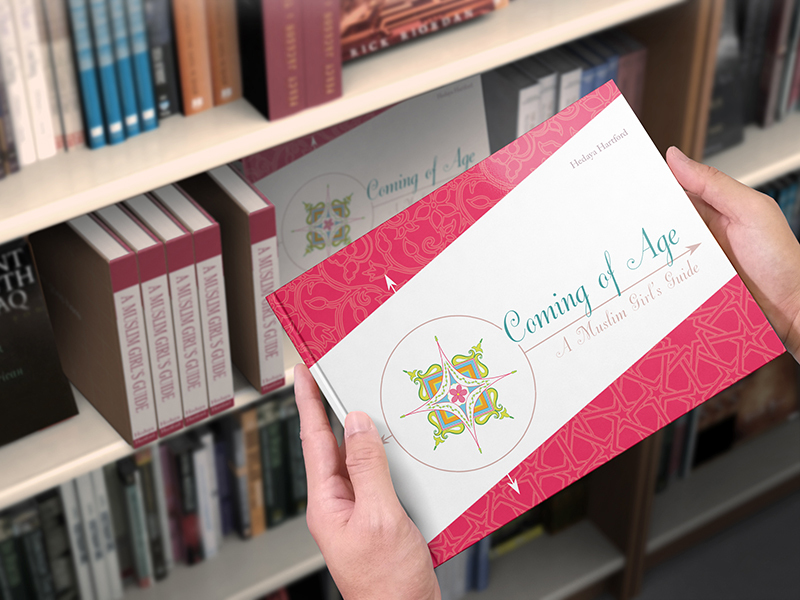 Coming of Age is here to help you. Young girls aged 8-13 should be able to understand it with your help, whilst those 14+ should be able to read it on their own. If your daughter has reached puberty and you never gave her the guidance she deserves, gifting her this guide is an opportunity to fix things and ensure she has a clear understanding of the subject. It's also meant to be a reference book that you and her can return to over and over again. May Allah Most Generous bless all who read this book with success in following His beloved Messenger (Allah bless him and give him peace) in all acts of worship and practice. And may Allah Most Merciful bless us with an increase of baraka, understanding, and the love of Allah and His Messenger (Allah bless him and give him peace) in this world and the next. Ameen. And all tawfeeq comes from Allah Almighty alone. Also known as Umm al-Khayr, Ustadha Hedaya Hartford is a teacher, translator and Shariah expert in the fiqh of menstruation, lochia, marriage and divorce. She was born and raised in California and holds a Bachelors of Arts in Arabic and Islamic History & Culture from the University of California, Berkeley. She converted to Islam in 1981. She studied for many years with Azhari scholars in Egypt, completing the second year of Shari'ah at al-Azhar University. She studied Hanafi fiqh with Dr. Abdul Aziz Izzat and Shaykh Fahmi Abdullah; and studied Aqida with Shaykh Abdul Aziz Batishti. In Damascus, Syria, she studied several books in Usul & Hanafi fiqh including the Risala al-Birgivi (Imam Birgivi's Manual on Menstruation) with Shaykh Hassan al-Hindi; Hanafi fiqh, hadith and hadith sciences with Shaykh Adnan Darwish; Hanafi fiqh including Risala al-Birgivi with Shaykh Abdul Rahman Arjan; and menstruation and related issues according to the Shafi'i madhab with Shaykh Hussein Darwish, Anisa Hanan Da'doosh and Dr. Mustafa Khin and Tariqa al Muhammadiya by Imam Birgivi with Shaykh Mustafa al-Turkmani. In Amman, Jordan, she studied menstruation and related issues according to the Maliki madhab with Ustadh Abdus Shakur Brooks; and she continues to study Hanafi fiqh with Shaykh Ahmad al-Jammal and tafsir with Shaykh Ali Hani. Please help your sisters fulfill the rights of their daughters by sharing this page on Facebook, Google+, Twitter, WhatsApp, email etc. Remember, "Whoever guides someone to virtue will be rewarded equivalent to the one who practices it."